"Promoting the Enjoyment of Observing and Learning for All"
Stellar flares and their impact on planets. Jackie Villadsen is a Jansky Fellow at NRAO in Charlottesville, completed her PhD at Caltech in 2016. She uses radio spectroscopy of stellar flares to search for extrasolar space weather events such as coronal mass ejections and stellar aurorae. Steve Layman will provide an introduction to how to remotely operate the RRRT (Rapid Response Robotic Telescope) located on Fan Mountain to take astronomy images. This is a new benefit for CAS members! We conduct monthly meetings every month at McCormick Ob servatory starting at 7 pm. 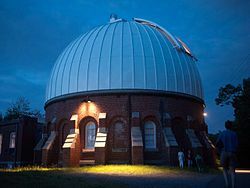 There is a featured astronomy speaker, the McCormick 26″ telescope is opened for observing (weather dependent) and sharing of information with other club members.